Attention, "Lost" fans: This is your chance to win a full set of six "Lost" action figures from McFarlane Toys -- signed by creator Todd McFarlane. Jack, Kate, Hurley, Locke, Charlie and Shannon are all included. All it takes to win is some clever analysis -- or lucky guesses. The person who answers the most questions with the greatest accuracy wins. The winner will be announced once the last question is answered on the show, or at the end of the season, whichever comes first. We'll provide updates as the mysteries are solved. Type your answer to each question in 50 words or less and mail or e-mail it to us. No entry form is required, but be sure to include your name and telephone number. And work fast! All entries must be in our hands by 5 p.m. Feb. 5, two days before the new season begins. Who will die next and how will that person die? What will happen to Ben Linus/Henry Gale on the operating table? What caused the paralysis in Locke's legs? Where will Claire and Charlie's relationship go? What will happen with the Kate-Sawyer-Jack love triangle? 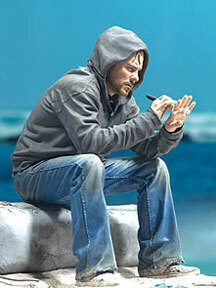 A full set of six "Lost" action figures, signed by the creator, including this figure of Charlie. Unsigned, the set is worth $120. » E-mail responses to lost@starbulletin.com, or mail to "Get Lost," Honolulu Star-Bulletin Features section, 7 Waterfront Plaza, Suite 210, Honolulu 96813. Entries must be typewritten. » One entry per person. Hawaii residents only. Employees of the Star-Bulletin, Midweek, their families, and members of the "Lost" cast, crew or production company, are ineligible. » Judges' decision is final. All comments may be published without compensation to the writer. Wines of New Zealand's Marlborough region will be featured at a seafood dinner at 6:30 p.m. tomorrow at Brasserie du Vin. Chef Scott Nelson's menu includes Montagnard Cheese with White Wine, Extra Virgin Olive Oil and Garlic (with Nobilo Icon Sauvignon Blanc 2005), Pan-roasted Grouper a la Almond Noisette (Kumeu River Chardonnay 2004 and Mount Difficulty Pinot Noir 2004), Eggs Dauphine with Fried Green Tomatoes and Salmon Gravlox (Craggy Range Le Sol Gimblett Gravels Syrah 2004). Cost is $65. Call 545-1115. Alan Wong's King Street restaurant offers a Next Generation Dinner featuring a menu by chef Wade Ueoka on Feb. 8. The menu: Fresh Picked Dungeness Crab (with Gruner Veltiner "Steinsetz" Schloss Gobelsburg 2005), Garlic Herb Big Island Goat Cheese with Lavosh ("Somanna" Ash Hallow 2005), Thai Spiced Seafood Gumbo (Riesling Spatlese "Schlossbockelheimer Felsenberg" 2005), "Corned Beef and Cabbage" (Braised Shortrib and Kim Chee-Braised Root Vegetables, with Morgon "Cote du Py" Jean Foillard 2005) and a Waialua Chocolate Sampler (Pedro Ximenez "Gran Reserva" Bodegas Toro Albala 1971). Cost is $75, $105 with wine pairings. Call 949-2526.